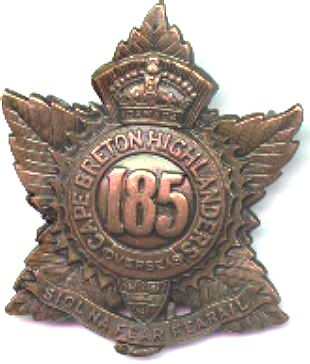 Perpetuates the 85th and 185th Battalions, Canadian Expeditionary Force. 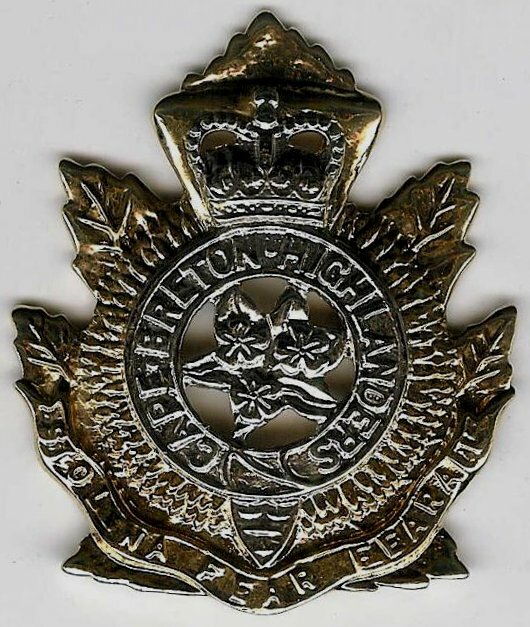 85th Bn, C.E.F.- "Arras, 1917, '18, Vimy, 1917, Ypres, 1917, Passchendaele, Amiens, Scarpe, 1918, Drocourt-Queant, Hindenburg Line, Canal du Nord, Valenciennes, Sambre, FRANCE AND FLANDERS, 1915-18"
The Cape Breton Highlanders (predecessor to the 2nd Bn, NSH) - "Arras, 1917, '18, Vimy, 1917, Ypres, 1917, Passchendaele, Amiens, Scarpe, 1918, Drocourt-Queant, Hindenburg Line, Canal du Nord, Valenciennes, Sambre, FRANCE AND FLANDERS, 1915-18"
The North Nova Scotia Highlanders (M.G.) 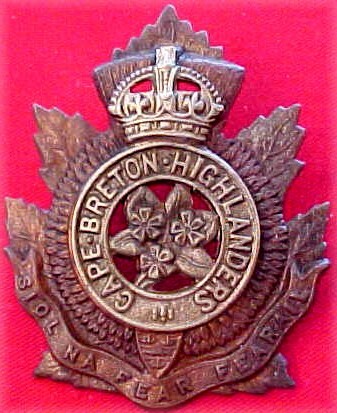 (predecessor to the 1st Bn, NSH) and The Cape Breton Highlanders (predecessor to the 2nd Bn, NSH) were mobilized during the Second World War. 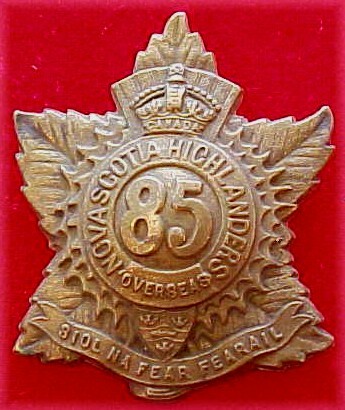 These regiments became the Nova Scotia Highlanders on 21 June 1955. 1st Battalion, The Nova Scotia Highlanders (North) and 2nd Battalion, The Nova Scotia Highlanders (Cape Breton) - "LIRI VALLEY, Melfa Crossing, Ceprano, GOTHIC LINE, Montecchio, CORIANO, LAMONE CROSSING, Fosso Munio, Conventello-Comacchio, ITALY 1944-45, NORMANDY LANDING, Authie, CAEN, The Orne, BOURGUEBUS RIDGE, Faubourg de Vaucelles, Verrieres Ridge - Tilly-la-Campagne, FALAISE, The Laison, Chambois, Boulogne 1944, Calais 1944, THE SCHELDT, Savojaarde Plaat, Breskens Pocket, THE RHINELAND, Waal Flats, The Hochwald, THE RHINE, Zutphen, Ijsselmeer, Leer, Delfzijl Pocket, NORTH-WEST EUROPE 1944-45"
The Eighty-fifth in France and Flanders [microform] / by Joseph Hayes. Halifax [N.S. ]: Royal Print & Litho, 1920. The Eighty-fifth in France and Flanders / by Joseph Hayes. Halifax [N.S. ]: Royal Print & Litho, 1920. 5 microfiche.